First off let me begin by saying, “Happy New Year!” We had so much fun opening our New Year’s sacks last night. Yes, last night. I know last night was not New Year’s Eve, but Peanut ended up falling asleep after a long day at the grandparents on New Year’s Eve so we decided to pretend last night instead. Such fun! Peanut enjoyed all of her sack activities, but I think her favorite was the glow-in-the-dark bath. I got the idea off of one of my favorite blogs, Play at Home Mom, whose children have fun playing with all sorts of objects in the water. 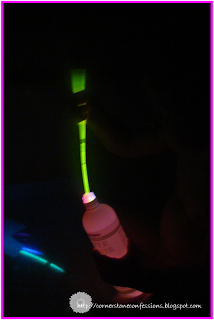 In fact, I wouldn’t doubt if they’ve played with glow sticks at bath time too, although the post that stemmed our glow-in-the-dark experience actually came from one about water beads in balloons. Such fun. 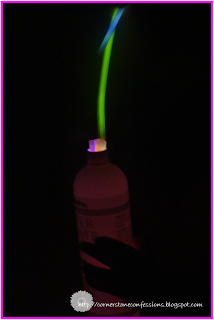 Anyway, we purchased a box of 12 glow sticks for a $1 at the Dollar Tree. Here’s the result. 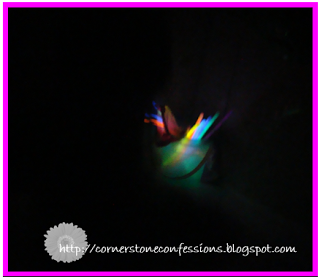 As soon as Peanut got used to the dark she began gathering all the glow sticks in her hand right away. How many are there? 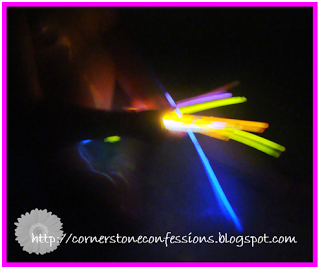 She then started putting the glow sticks into an empty shampoo bottle. She had so much fun doing this she did it again and again! Hope you had fun ringing in the New Year too. Now its onto 2012! What a great idea. I wish I would have had you to inspire me a couple of kids ago. I only have one left that needs help in the tubby. I am sure going to try this with him though. Looks like a lot of fun, thanks for the inspiration!